Conscience rights and religious liberty are a founding principle of the United States. They have long been protected, whether it's the U.S. Constitution's First Amendment or the tradition of exempting conscientious objectors from military service. Where does Debbie Stabenow stand on conscience rights that involve prolife issues? On March 22, 2013, U.S. Senator Deb Fischer (R-NE) offered an amendment to a budget resolution that would have stopped the Obama Administration's HHS Mandate. The mandate requires employers and individuals to pay for drugs and procedures that may cause abortions by listing those methods as "preventative health services." Debbie Stabenow voted against this amendment and the Fischer Amendment failed by a vote of 44 to 55. This vote forced the Little Sisters of the Poor—a Catholic religious order of women dedicated to caring for the elderly poor—to seek a court order to prevent themselves from being forced to spend precious resources on purchasing abortion-inducing drugs. Numerous other organizations and individuals also filed in court to protect their conscience rights from the HHS Mandate. In 2014 the U.S. Supreme Court ruled in Burwell v. Hobby Lobby Stores that the HHS Mandate violated federal law involving closely held-corporations. 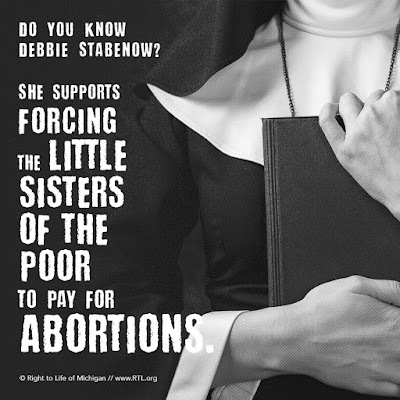 The Little Sisters of the Poor are not a closely-held corporation, however, and their court case continued until the U.S. Supreme Court ruled unanimously in 2016 in Zubik v. Burwell to require the Obama Administration to fix the HHS Mandate to protect the conscience rights of the Little Sisters and other nonprofit groups. Following the 2016 election the Trump Administration has promised to restore the conscience rights of the Little Sisters of the Poor and others. Forcing everyone to purchase health care plans that include free abortions? 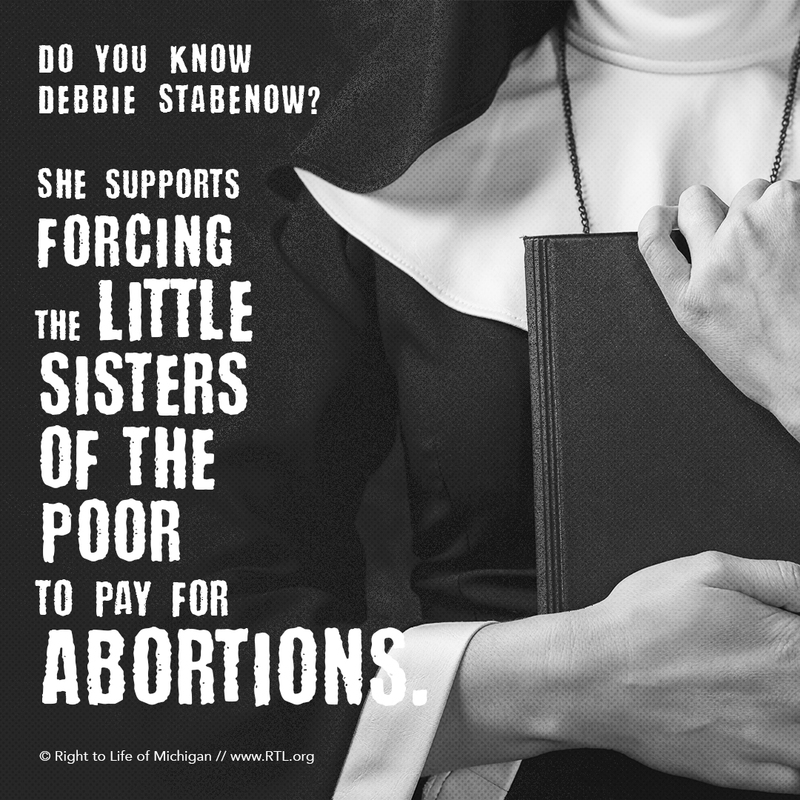 When the ruling in Burwell v. Hobby Lobby Stores was handed down, Debbie Stabenow and other senators sought to change federal law to force the Little Sisters of the Poor and others to purchase health insurance plans that cover drugs that may cause abortions. On July 16, 2014, the U.S. Senate took up S. 2578, which would have given the Obama Administration authority to supersede every federal law and conscience protection to force people to purchase any "preventative health service" they mandate. The bill would include superseding the Hyde Amendment, which protects taxpayers from being forced to directly pay for abortions, meaning the bill would have allowed the Obama Administration to force every insurance plan in the country to cover abortions for "free"—even late-term abortions—or doctor-prescribed suicide. Stabenow voted for S. 2578, but the bill failed to reach the 60-votes necessary to end debate. Since 1985 the Kemp-Kasten Amendment has prevented the United States from funding coercive population control organizations overseas that include forced abortions or forced sterilizations. For example, George W. Bush's administration restricted taxpayer funding to the United Nations Population Fund when it was revealed they were complicit in cooperating with China's One-Child Policy that involves forced abortions and sterilizations. In 2007 an attempt was made to weaken the Kemp-Kasten language in a Senate appropriations bill. On September 6, 2007, an amendment was approved to restore the Kemp-Kasten protections by a vote of 48 to 45. Debbie Stabenow opposed this effort to protect the human rights of individuals overseas and American taxpayers from being forced to help engage in coercive population control programs.